This will be a great way to prepare for the summer season. The exercises that she sets will not only help you hone your skills, they will help you and your horse to develop a better sense of working together in harmony. Add to that her encouraging and upbeat teaching style, horses and riders, to put it simply, just have FUN. And who knows; you may just end up jumping some of the lines that she will be using for the courses at Winona in May. 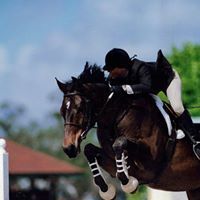 Leigh has trained with Joe Fargis & Conrad Homfeld for 13 years while showing jumpers in Fl. In addition she has also worked for Greg Best and still rides with both Joe & Greg when she has them come to the farm for clinics. In addition to training with some of the best; Leigh is the head instructor at Sugar Brook Farm in NY and has been the coach for the Alfred University intercollegiate team and the very successful High Time Stables IEA Team. Leigh also has a strong dressage and eventing background (through the ** level) which gives her a better understanding of the needs of the ‘event’ horse and rider. Clinic fee: $60/day Participants may sign up for one or both days.